We have nearly finished our transect sampling iron from the deep ocean back to the shelf. The iron group is fairly excited, because in all of the profiles we have done gradually working along and up a seabed canyon there has been evidence in the CTD data of lots of suspended particles near the seabed. There must be some flow of water down there that is pulling sediments, along with trace metals such as iron, up off the seabed which is exactly what the scientists are looking for. Other lab work continues also, as the iron chemists need to know what else is happening in the water to help understand what they are seeing. 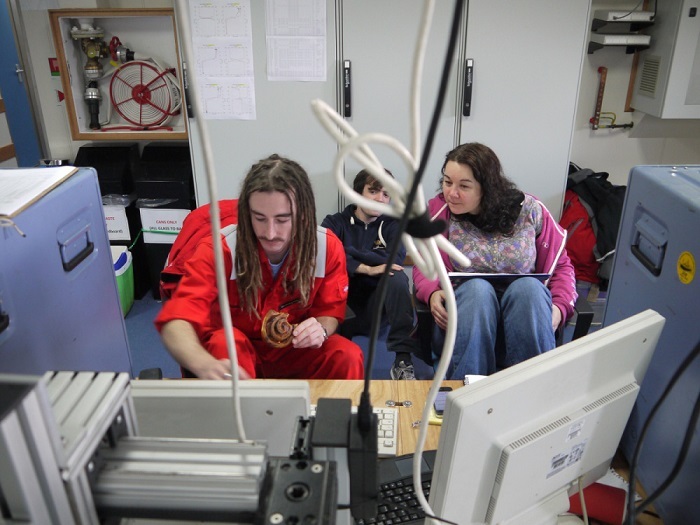 Chata, a PhD student from the University of East Anglia, has spent the past 3 days trying to fix a machine she uses to measure argon, oxygen and nitrogen gas dissolved in seawater. The machine is refusing to work properly, so she is having to store samples for analysis later back at University. Oxygen and argon behaviour similarly in seawater, and in the rates they can be transferred from the atmosphere to the ocean. However, oxygen also has a biological component to how it changes – if the ocean’s microbial plants are growing, then (like all plants) they produce oxygen. Chata can compare what she sees the argon and the oxygen doing in the water, and any differences between them will tell her about how the biology in the ocean is working. 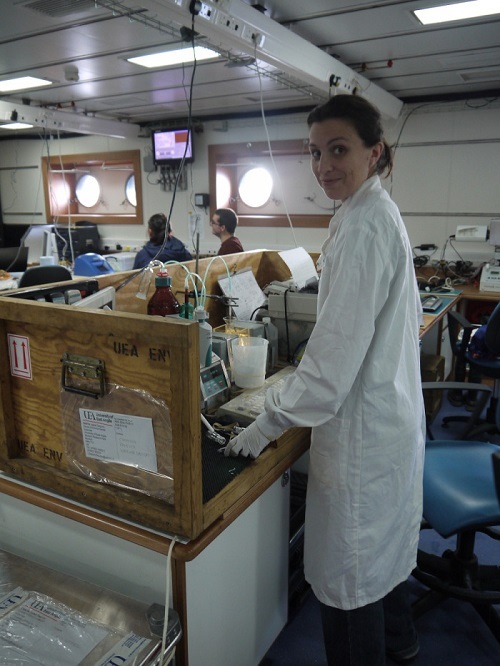 She is also helping us by doing chemical analyses of water samples to measure the oxygen concentration, which will allow us to calibrate the oxygen sensor that we have on our CTD. Due to finish this transect at about 0100 tomorrow. We then plan to start th second of our main study stations, this time sat at the edge of the continental shelf.